Nice 1890's smokeless rifle powder can with original brass cap. 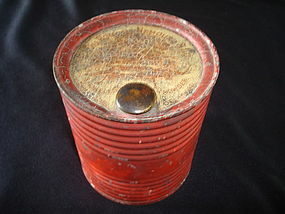 This is a E.I DU PONT NEMOURS & CO. can. The top of the can features a painted label with a stag. The bottom of this can reads Smokeless Rifle Powder Number 1, pattented August 22ND 1893. This can maintains most of its original red paint and stands 3 7/8" high and is 3 3/8" in diameter. Is in very good condition for its age!!! 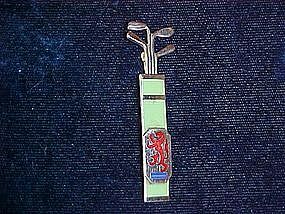 Wonderful 1950's Golfer's Key Chain. 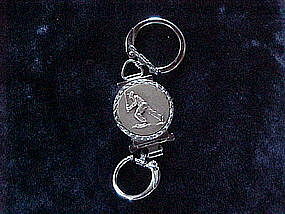 This golfer key chain is in Mint condition and measures 3 1/2" in length. 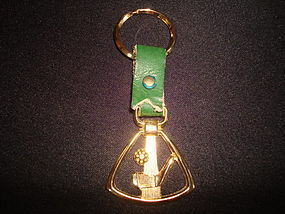 It features a retro styled gold toned medallion with golf club and ball joined by genuine leather strap with metal key ring. The medallion is signed on the back with a crown in circle and on its left a R in circle and on its right a C in circle. This would look great hanging from the key of a golf cart or a golfer's beloved classic 50's car!!! 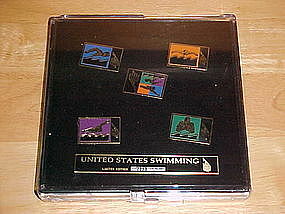 Five original Olympic Swimming pins in original case. This collection was a limited edition set issued for the Summer Olympic Games held at Atlanta, Georgia in 1996. This set is numbered 7338/10,000 and has its original Certificate of Authenticity. The case also has its original hologram and has also its original plastic wrapping. 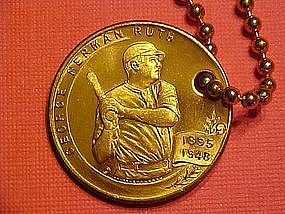 Super circa 1950's key chain featuring baseball player at bat. This great item also doubles as a locket that can hold two mini photographs. It comes with original vintage photos of a man and a lady that are probably movie stars. This item is in Excellent condition and measures about 3 1/2" long. Nice lot of vintage bowling award pins. 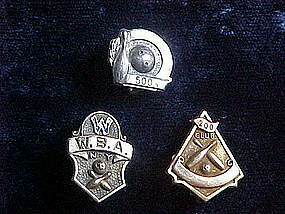 These are circa 1940's - 50's award pins and includes as follows; (1) 200 Club gold filled pin signed in back " House of Williams Chicago, (1) 500 Club pin marked "sterling", and (1) gold filled W.B.A. New York pin that is marked in back " Johnson N.Y. National, 1/20 - 10K, and it is engraved HI-5". 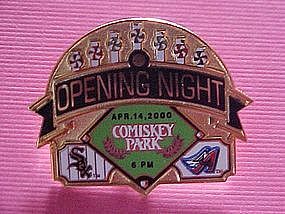 These pins are in fine to very fine condition. Nice vintage bowlers award pin lot. They are circa 1940's to 50's. Two are sterling silver which include a 200 Club and a 500 Club pin. 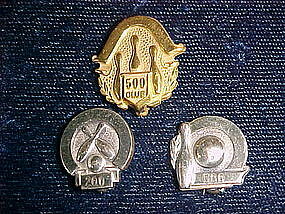 The other is gold filled and is a 500 Club pin. They are in fine condition. 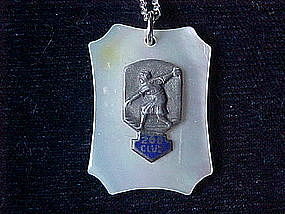 Vintage 1940's - 50's ladies 200 Club bowling award pendant. This cutie features a sterling silver plaque with lady bowler and in enamel it shows 200 Club. The sterling plaque is mounted on a genuine mother of pearl shell pendant and comes with its original 17 1/2" long fine sterling silver chain. 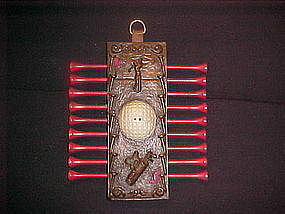 The pendant measures 1" long x 3/4" wide. This item is in fine condition. 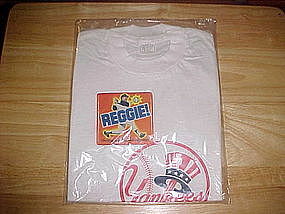 Original Reggie Jackson's Reggie Bar introduction give away T shirt. 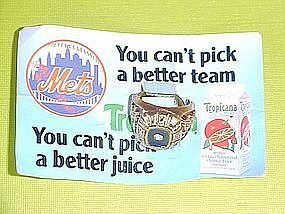 This T shirt was a give away advertising item to introduce Reggie Jackson's new Reggie Bar. The Reggie bar was introduced shortly after the NY Yankees 1977 World Series Win. This rare T shirt is in unused condition complete with its original packaging. It was made in U.S.A and it is size M 6-8. There are two (2) available. Great replica World Champions ring made in a limited quantity to give out at the Cardinals home stadium after they won in 1982. 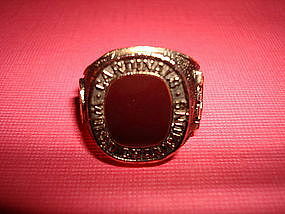 This ring is in MINT condition and is great piece of Baseball Memorabilia. Made of a heavy weight metal.